Thank You for whatever you are led to do in helping us continue to Make a Difference. Thanks for Donating Today!!! Online giving is an incredible tool and a safe way to honor the Lord with your gifts and helps you remain faithful in your stewardship anywhere and anytime. an ongoing gift), makes a tremendous difference. Thank You and God Bless You for Your Generosity!!! 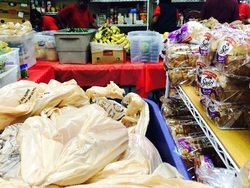 1:15 p.m. - 6:15 p.m.
"Fighting Hunger ~ Feeding Families ~ Impacting Lives"
Weekly we see many individuals and families in PB Country come through our doors who struggle with hunger. Many have not had a decent meal in days. Through your support, you allow us to provide them with food, clothing, and encouragement they so desperately need. We take on the critical role and weekly responsibility of rescuing, collecting, and distributing usable, surplus food to feed those in need, regardless of race, religion, ethnicity, or gender. We also have a FREE clothing and household item pantry that is available to all of our visiting guests. This is a growing, ongoing work that we cannot do without your much needed assistance. 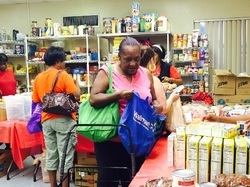 Please Join Us in our mission to help those who are struggling with hunger in our community by partnering with us. You may donate surplus food from your restaurant, catering company, country club, farm, or other food business. We welcome support from corporations or donations in honor of a family member or friend as an enduring tribute in their honor. 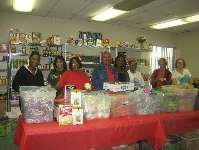 You may even organize a food drive in your workplace, neighborhood, school, or place of worship. 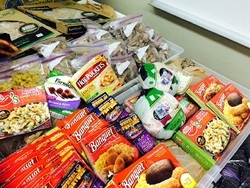 Each week we are in need of: Rice - Pasta - Dry Beans - Potatoes - Onions - Soups - Cereal - Canned Goods - Snacks - etc. Today, your act of kindness and generosity makes you an instrument of God's unconditional love for those in need. Thank you for being a part of the answer to the prayers of a family crying out for help to put food on the table for their children. Our mission is Life Changing. 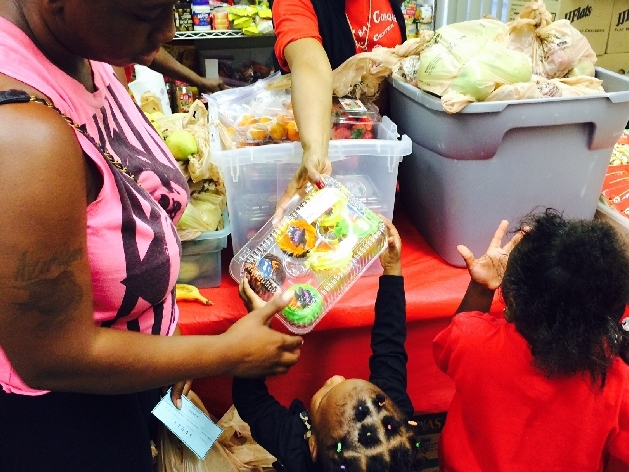 We are also seeing many people come to faith through this effort that begins with a meal. Many return to volunteer, and also attend our other weekly services. We value your support at any level, and you are an integral part of our success. Please be as generous as you can. All donations are tax deductible and go to support our operation and distribution. Your faithful support tells me you also have a heart for those in need. Thank You for partnering with us to help Fight Hunger, Feed and Clothe Families in our community. God Bless You for whatever you are led to do in helping us Make a Difference. Your One Time donation or Monthly recurring donation will be a tremendous help and will be greatly appreciated by so many. Thank You for Your Donation Today!!! God Bless You. Thank You and God Bless You for Your Support!!! 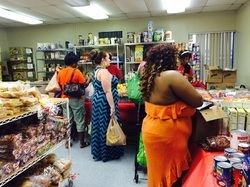 "Thank God and the help of this Food Pantry and Church staff. 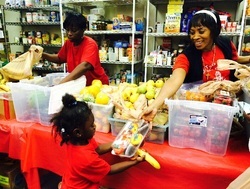 The Food Bank means another meal for me and my grandkids. I look forward to coming here." "It's a blessing, because I don't have a job or no source of income." "I would like to say thank you for the food and most of all for the staff. NOT ONE Person made me feel "Why are you here." The love overpowered the food. I thank God for you all. Most people would shy away because of how they are treated if they are hungry. This year was hard for my family and we know what it is like to be down, out, and broke. Thank you and please thank all the staff." 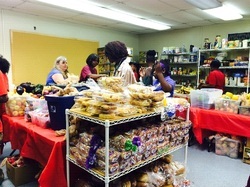 S.G.
"I would like to Thank More Than Conquerors for providing food and services to the community. It just shows that there are people that care about others." I.A. "I am thankful for More Than Conquerors Ministry for all the help me and my family have received. Being laid off from work and trying to make ends meet with food and prayer, I am grateful. 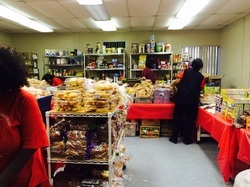 Without the help of this food pantry I do not know where I would be. The atmosphere and church family have been greatly appreciated. I would like to thank everyone involved in helping the community. May God continue to bless your ministry." H.
"My name is B.W. - I am saved and I just thank God for MTCLC. Everyone is so nice and considerate. I thank God for the caring heart and the love that you feel when you enter the building. I thank God for the food that helps me so much. The snacks that you have while we are waiting and the music is so blessed and makes you feel so welcome. Thank you MTCLC and God bless all of you. I love you. Keep going in Jesus Name." to: MTC or More Than Conquerors. All gifts are tax-deductible as allowed by law. Leroy Freeman Evangelistic Association, Inc./More Than Conquerors is a 501(c)(3)member in good standing with the Full Gospel Fellowship of Churches and Ministers International. Items Needed to Help Us do more to assist those in need.